The US (who declared to the world that its B52 bombers were unarmed), Australia, South Korea do not matter, according to the editorial in the English language paper Global Times by China's People's Daily. Japan has been giving fierce reaction to China's demarcation of the East China Sea Air Defense Identification Zone (ADIZ). Japanese Minister of Defense Itsunori Onodera has made malicious remarks almost daily since last Saturday when the zone was set up. Perhaps that just proves a folk saying: The more guilty one feels, the more unscrupulous he will be. Apart from Japan, the US and Australia have also rebuked Beijing for its new air defense rules with provocative remarks or actions, and even South Korea's foreign ministry expressed formal regrets over the ADIZ. Nonetheless, all the criticism and provocation will not pose a real challenge for the newly created ADIZ. It is a fact that China has already established its ADIZ over the East China Sea. Maybe an imminent conflict will be waged between China and Japan. As a staunch supporter of Tokyo, Washington is expected to refrain from confronting Beijing directly in the East China Sea, at least for now. Canberra and Seoul just chimed in. The Chinese government is supposed to remain resolute in its strategies while taking flexible and resilient measures to cope with unexpected accidents. If the US does not go too far, we will not target it in safeguarding our air defense zone. What we should do at present is to firmly counter provocative actions from Japan. Australia, having no real conflict with China now, can be ignored at the moment. Seoul understands it is not the target of China's ADIZ, plus it has tensions with Japan right now, therefore, China has no need to change its actions toward South Korea. We should carry out timely countermeasures without hesitation against Japan when it challenges China's newly-declared ADIZ. If Tokyo flies its aircraft over the zone, we will be bound to send our plane to its ADIZ. If the trend continues, there will likely be frictions and confrontations and even tension in the air like in the Cold War era between the US and the Soviet Union. It is therefore an urgent task for China to further train its air force to make full preparation for potential conflicts. We are willing to engage in a protracted confrontation with Japan. Our ultimate goal is to beat its willpower and ambition to instigate strategic confrontation against China. Though Beijing has encountered difficulties in the nascent stage of the ADIZ, Chinese authorities appear calm in the wake of all the provocations. The Chinese nation is heading towards peace and prosperity with peace-loving people. Turbulence over the Diaoyu Islands and the East China Sea Air Defense Identification Zone will in no way alter China's overall architecture. Fierce reaction? The US, staunch supporter of Tokyo, is to refrain from confronting Beijing? What they are saying doesn't make much sense, but I suppose it is a good match for the equally incomprehensible Abe administration. BBC reports (11/29/2013) that China scrambled fighter jets to monitor Japanese fighter jets and the US surveillance planes entering, as far as Japan and the US know, their ADIZ over Senkaku Islands. Feel like rolling our collective eyes and saying "Whatever...", or "WTF?" (take your pick)? 1. Ever-clumsy TEPCO drops a video camera into the Reactor 3 Spent Fuel Pool. TEPCO announced on November 28 that a monitoring camera was dropped into the Spent Fuel Pool of Reactor 3 at Fukushima I Nuclear Power Plant by mistake, during the preparation work for the removal of debris inside the pool. The camera weighs about 5.5 kilograms, and the company says there is no danger of fuel damage from the drop. According to TEPCO, when the workers pulled the monitoring camera out of the water via the remote control, the cable snapped, and the camera dropped from the height of several meters. The cable snapped when it was wound up too tight, and the safety mechanism to prevent the tight winding failed to work. Unlike Reactor 4's operating floor, Reactor 3's operating floor is too radioactive for humans (and for robots, probably) with one location above the shield plug exceeding 2 Sievert/hour air dose rate. 2. The 33rd Ministry of Justice human rights essay contest for junior high school students has been won by a student in Miyagi Prefecture who wrote not buying Fukushima's peaches because of radiation fear was the same as him being "discriminated" against by his classmate for being a Chinese national. Refusing the Fukushima produce because of radiation fear is tantamount to racial discrimination, according to the student and the Ministry of Justice who selected his essay as the best of the best this year. (The essay in PDF here, for those of you who read Japanese.) Not buying Fukushima produce, as the government tells you to? You're racist (or, transliterated into Japanese as "reishisuto" with "r" pronounced like "l")! 3. Perishable food price in Japan shot up 16.6% compared to a year ago, with overall consumer price (including food and energy) up 1.1%, according to Reuters Japan. BOJ's Kuroda seems happy that his "QE from another dimension" (or I'd call it Twilight Zone QE) is working, the media paints it as evidence that "Abenomics" (or "Avenomics" ) is working. Good luck, working class citizens of Japan. 4. 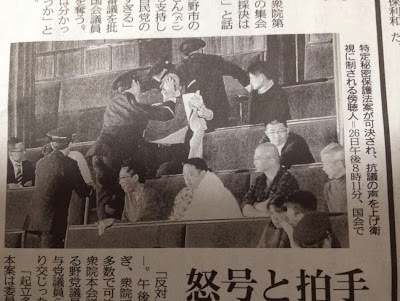 A citizen was forcibly removed from the balcony in the Diet where he was observing the debate of the State Secrecy Protection Law in the Lower House on November 26, 2013, as he shouted his opposition to the passage of the law. His mouth was stuffed with cloth so that he couldn't shout any more while being removed by several guards against his will. What's even scarier to me than the man being forcibly removed by the guards is people sitting near him. They just sit there as if nothing is happening. They are not even looking; the one in the same row even looks away. 5. While the above citizen was being hauled away by security guards, the Representatives in the Lower House in the supposedly tense and heated debate over the State Secrecy Protection Law were anything but tense and heated, according to Nikkan Gendai (11/27/2013). on November 27, 2013, the day after the Lower House had passed the equally controversial (or should be) but more hyped State Secrecy Protection Law. 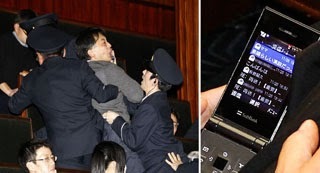 The legislation to create the NSC for Japan has already passed the Lower House, so now it becomes the law of the land. There is no opposition to speak of. Nearly everybody in the legislative branch (National Diet) is on board, in both Houses, to give a huge power over foreign affairs and defense to the executive branch (the LDP/Abe administration). Again, the ostensible reason is that the US wanted Japan to have the NSC like the one that exists in the US, so that confidential information can freely be shared between the US and Japan. The Japanese government has already passed the national ID law, again with near unanimous vote. The reason why I am rather cynical about the current hype and hyperventilation over the State Secrecy Protection Law is these two laws - one to create the NSC and the other to assign a unique number to each and every citizen in Japan (with the cute moniker "My Number"). They have passed these two laws already, with hardly a squeak from the media and the citizens. "This legislation even targets the members of the National Diet. Aren't we, as members of the Diet, supposed to fight against the huge power of the executive branch and the bureaucrats?" Mainichi reports there was a huge applause after he finished speaking. Let's see. Was there an outrage over the "My Number" legislation and the NSC legislation? Nope. Power grab by the executive branch in these two laws has gone unnoticed, or I should say unrecognized as such, either out of ignorance or out of self-censorship, by the legislators, media, and citizens. AP has a nice summary of the situation surrounding Japan's state secrecy protection law which easily passed the Lower House (House of Representatives) yesterday (11/26/2013) with votes from Liberal Democratic Party, Komei Party, and Your Party. There are 294 Representatives from LDP alone in the Lower House with total 480 Representatives. One of the ostensible reasons for the ruling coalition (LDP, Komei)'s push for the passage of the law has been that, without such a law, no foreign country will share sensitive information with Japan. TOKYO – A proposed state secrecy law in Japan that imposes stiffer penalties on bureaucrats who leak information — and journalists who seek it — is spurring a public outcry, with opponents blasting it as a heavy-handed effort to hide what the government is doing and restrict press freedom. The public's top concern is that the government won't say exactly what it wants to make secret. Critics say the law could allow the government to withhold information about whatever it wants and ultimately undermine Japan's democracy. The ruling party says the "secrecy protection" law, which the lower house of parliament could vote on as soon as Tuesday, is needed to allow the United States and other allies to share national security information with Japan. Along with the creation of a U.S.-style National Security Council in his office, it's part of an effort by Prime Minister Shinzo Abe to beef up Japan's role in global security, and make a more authoritarian government at home. The moves are welcomed by the United States, which wants a stronger Japan to counter China's military rise, but they raise fears in Japan that the country could be edging back toward its militaristic past, when authorities severely restrained free speech. "My biggest concern is that it would be more difficult for the people to see the government's decision-making process," said Kyouji Yanagisawa, a former top defense official who was in charge of national security at the Prime Minister's Office from 2004-2009. "That means we can't check how or where the government made mistakes, or help the government make a wise decision." The bill allows heads of government ministries and agencies to classify information related to defense, diplomacy, counterintelligence and counterterrorism, almost indefinitely. Critics say that it might sway authorities to withhold more information about nuclear power plants, arguing they could become terrorist targets. Or they warn that officials may refuse to disclose key elements of free trade talks to protect concessions that would make Tokyo or a partner look bad. At a public hearing in Fukushima on Monday, the only one held by the government just before the planned vote, lawyer Hiroyasu Maki said the bill's definition of secrets is so vague and broad that it could easily be expanded to include radiation data crucial to the evacuation and health of the residents in the case of another nuclear crisis. Ruling Liberal Democratic Party lawmakers say Washington has repeatedly said that they feel insecure about sharing top security information with Japan due to its lack of legal protection for secrets. The U.S. is worried about leaks to China, they say. "(The bill) is by all means necessary to step up Japan's intelligence levels. Many other countries already have legal framework like this but Japan does not," said Nobutaka Machimura, a senior ruling lawmaker and head of the party's secrecy bill team. Under the bill, leakers in the government face a prison term of up to 10 years, up from one year now, if convicted. Journalists who get information "inappropriately" or "wrongfully" can get up to five years in prison, prompting criticism that it would only make officials to be more secretive and intimidate the Japanese media. "This is a severe threat on freedom to report in Japan," said Lawrence Repeta, a law professor at Meiji University in Tokyo. "It appears the Abe administration has decided that they can get a lot of what they want, which is to escape oversight, to decrease transparency in the government by passing a law that grants the government and officials broad authority to designate information as secret." Experts including Repeta say the new law paves the way for Abe's drive to revise Japan's U.S.-drafted pacifist constitution to give more power to the government and stress civil duties over basic human rights. Currently, Japan lacks a comprehensive legal framework to protect state secrets except for "defense secrets" that the Defense Ministry is allowed to decide. The proposed bill would complement a separate law, also due to be passed this week, to establish a National Security Council that would centralize the chain of command in the office of the prime minister and give him more power. Washington sees the proposal as a positive step that would make Japan "more effective alliance partner," U.S. Charge d'Affairs Kurt Tong said in his recent speech in Tokyo. He urged Japan, however, to make the process transparent and to explain the policies to its Asian neighbors. The former bureaucrat, Yanagisawa says he does not recall any instance Japan failed to obtain necessary information from Washington or other countries due to lack of secrets law. When the U.S. or other countries decide not to share information with Japan, it was because of their own national interest not because of Japan secrecy protection, he added. Even without the new secrecy law, journalist Takichi Nishiyama, 82, was convicted for exposing confidential cables related to Tokyo's secret deal with Washington over the reversion of U.S.-administered Okinawa to Japanese control in 1972. He said what he revealed was only a tiny part of the mountain of secrets that never surface. He said that most classified Japanese military or diplomatic documents often come out of U.S. archives, not Japanese. "In this country, it's already difficult enough to get information to verify our own history," Nishiyama said. "The new law would only make it worse." Japanese and foreign journalists, writers, academics and activists have opposed the bill. On Thursday, about 10,000 people gathered at a Tokyo park to protest the bill. According to the result of government-sponsored "public comment" process in September, a policymaking procedure similar to public hearing, 77 percent of about 90,000 comments opposed the bill, most of them expressing concerns about a possibility of their civil activities being curtailed. Some people worry that the law might point Japan back toward severe restrictions on freedom of speech and press imposed before and during World War II. Under the Maintenance of the Public Order Act in 1925, some 100,000 people were arrested. Activist Kazuyuki Tokune says his attempts to access information about nuclear power plants may be considered illegal under a broad interpretation of the law. "I may be arrested some day for my anti-nuclear activity," Tokune said during a recent protest against the secrecy bill outside the prime minister's office. "But that doesn't stop me." The battle cry from the Japanese media - mainstream and alternative - over this law is that it will restrict press freedom. That is a bit preposterous, particularly coming from the mainstream media. Most have been little more than the government PR division, reporting what they are told to report without raising many questions or objections. What freedom will they lose? Freedom to report what they are told to report? What's more preposterous is the comment by the US Charge d'Affairs Kurt Tong. For the current US administration to lecture Japan on transparency is a joke. Now, more importantly, why is the Abe administration in such a great hurry to please the US by passing the law, particularly when not having such a law in place hasn't prevented Japan from obtaining information from the US or other countries? What would be the benefit that the administration would get in return, particularly from the US? Many in Japan do not even think about the problem from that angle, and their answer to the passage of the law in the Lower House is to express fear that Japan is heading back to pre-World War II era of secret police and to vent frustration that Japan is nothing but a territory of the US with no sovereignty. Quid pro quo for Japan, in my humble opinion, is the secret information collected by the US National Security Agency (NSA) on Chinese political and military intelligence. The article above hints as much, with "The moves are welcomed by the United States, which wants a stronger Japan to counter China's military rise". And that for the US? Another information laundering hub for the NSA, I presume, where the NSA ships information it is not supposed to be collecting, and re-import as "foreign intelligence" back into the US. Japan could do the similar thing: Have the NSA collect information on Japanese citizens, and receive that information from the NSA as "foreign intelligence". There is no penalty in the law for foreign entities to collect sensitive information in Japan. As to the Japanese citizens who are worried about freedom of speech suppressed, well they have let pass so many pieces of information of the government's misdeeds, willful neglect, suppression of critical information, even without the secrecy law. One of the most glaring examples in recent years is, in my mind, the very unusual NHK's documentary in the summer of 2011 that the Japanese government had known about the details of Hiroshima/Nagasaki atomic bombing and done nothing. (See my special posts for August 15, here and here.) Was there an outcry from citizens? Hardly. Were other news outlets covering the story? None. It's better late than never, but it is rather late. (UPDATE-2) The second day of fuel assembly removal (11/27/2013). 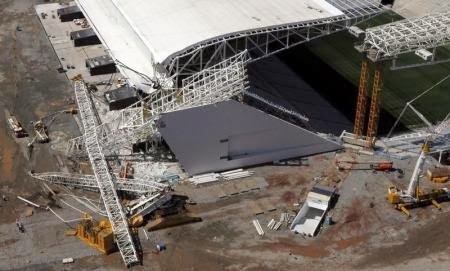 The work started at 9:30AM JST, according to TEPCO. On November 26, 2013, the workers removed six spent fuel assemblies into the cask in the cask pit inside the Reactor 4 Spent Fuel Pool. The work took about three hours - 30 minutes per one fuel assembly. (UPDATE) From TEPCO, the first spent fuel assembly from the pool was placed in the cask, at 3:21PM. Hardly anyone on the net in Japan is paying attention, as the bigger and more distressing (unless you are a staunch supporter of Liberal Democratic Party) news of the day is the passage of Secrecy Act in the special committee in the Lower House with overwhelming majority votes by LDP, Komei (the ruling coalition), and Your Party. 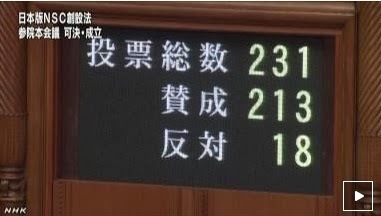 Passage in the Lower House (where LDP alone holds majority) is expected in the afternoon. Six groups of workers (6 workers each in a group) in two-hour rotations will remove 22 irradiated SPENT FUEL assemblies, according to Mainichi, unlike the first time when unused, new fuel assemblies were removed. Just like the first time, the entire operation will be done under water. So far, no news of a sizeable earthquake, and hardly any news coverage of the event. The second removal of fuel assemblies from the Reactor 4 Spent Fuel Pool at Fukushima I Nuclear Power Plant is scheduled today. At 10:56AM, the work started to move the container for the transfer of the fuel assemblies from the temporary storage location on the operating floor of Reactor 4 to the Spent Fuel Pool. At 11:29AM, the container was placed at the bottom of the Spent Fuel Pool. Removal of the spent fuel assemblies may be starting just about now (3PM, JST). (UPDATE) According to Yomiuri (11/26/2013), China's newly declared ADIZ includes the airspace used by the US military stationed in Japan. The US Department of Defense spokesman said that the US military has been conducting the training in the area, and the US will not submit flight plans to China as demanded by China. China seems to think they have Japan (and the US behind it) all figured out, and is confident that it can get away with it. The Air Defense Identification Zone, or ADIZ is already in place by the Japanese government over Senkaku Islands. Japan's ADIZ is almost identical to the airspace set by the US military, according to the Japanese wiki on ADIZ. China has tried to establish its authority over Japanese-controlled islands in the East China sea by demanding that all aircraft flying in the region obey its rules or face "emergency defensive measures". The East China sea air defense identification zone came into effect from 10am local time on Saturday when the Chinese defence ministry issued a map of the area, which includes the uninhabited East China sea islands. The ministry said all aircraft entering the zone must notify Chinese authorities and warned they would be subject to emergency military measures if they did not identify themselves or obey orders. It said it would "identify, monitor, control and react to" any air threats or unidentified flying objects coming from the sea. "China's armed forces will adopt defensive emergency measures to respond to aircraft that do not cooperate in the identification or refuse to follow the instructions," it added. ...But Narushige Michishita, director of the security and international studies programme at the National Graduate Institute for Policy Studies in Tokyo, said: "China is playing a dangerous game here. It is certainly an escalatory action and might prolong and exacerbate the ongoing tension." ...“Japan’s ADIZ [Air Defense Identification Zone] is a ‘trench in the air’ that is illegally occupying our country’s territory. To break the ADIZ is the first step to protect the sovereignty of the Diaoyu Islands (Chinese name of Senkaku Islands),” Liang Fang, a professor of strategy at PLA (People’s Liberation Army) National Defense University, told the Global Times this month. The newspaper is published under the auspices of the People’s Daily, mouthpiece of the Chinese Communist Party. ...China is also bolstering its military capabilities, especially by building aircraft carriers and developing new ballistic missiles, partly to deter U.S. forces from approaching areas around Senkaku Islands. “China’s establishment of the ADIZ seems to be a way of discouraging U.S. military aircraft from approaching Chinese territorial airspace,” a Japanese government official said. On the day that China announced its ADIZ, Japanese Defense Minister Itsunori Onodera held an executives’ meeting in the Defense Ministry. Those who attended the Nov. 23 meeting confirmed that the ASDF will continue to patrol the skies around Senkaku Islands in the same way as before. Those activities include scrambles if Chinese aircraft enter Japan’s ADIZ. After the meeting, Onodera voiced extreme concern about China’s latest move. “The unilateral declaration of the ADIZ without having any consultation with neighboring countries is an issue that we have to protest against. If an incident takes place in the ADIZ, it could trigger a dangerous situation,” Onodera told reporters. “I wonder whether Chinese aircraft will scramble when a (Japanese) SDF plane enters airspace claimed by China as its ADIZ. We need to see how China will operate its ADIZ,” a Japanese Defense Ministry official said. After the last-minute deal on Syria where the US president was outsmarted by the Russian president, and the latest nuclear deal with Iran despite the protest from the US's allies in the Middle East, China may be thinking the US is such a pushover and a wimp, and now's the time. South Korea is not too happy with China's newly expanded ADIZ either, which now covers the territory claimed by both South Korea and China, according to Asahi (Japanese).